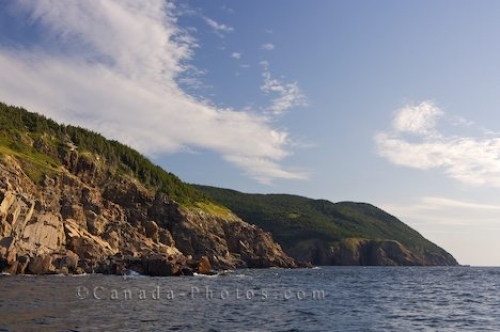 Traveling the waters of the Gulf of St. Lawrence on a whale watching trip that departed from Pleasant Bay in Cape Breton, Nova Scotia, you can view the beauty of the rocky coastline. Atop the jagged rocks, the landscape is blanketed with lush greenery as the waters crash against the rocks below. Coastline seen during a whale watching excursion from Pleasant Bay in the Gulf of St Lawrence, Cabot Trail, Cape Breton, Nova Scotia, Canada. Picture of the rugged coastline adorned with greenery from the waters of the Gulf of St. Lawrence in Cape Breton, Nova Scotia.